- Players try to get through gaps between players for a point. - If player&apos;s ball / body hit another player or they leave they lose all their points. - Messi / Ronaldo touches to find and get through gaps. - When to change direction. - Moments to use to change direction. - Players pair up with partners on opposite red cones on same side of area. 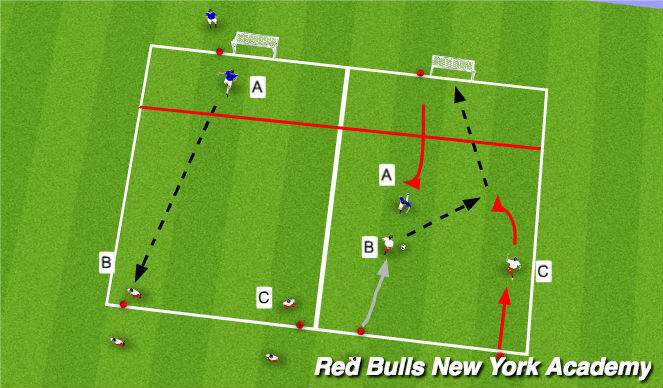 - Player A drives at orange cone and plays passes to player B and continues his run to the other side of the area. - Player B receives pass drives at the next oragne cones and beats it with move, faking towards the supporting teammate. - Player A and B replace players C and D.
- C and D begin when player B makes eye contact with player D.
- Players perform same technique going back other way but start in opposite roles. - Switch cone position after given amount of minutes to work on opposite foot. - Size of touch to approach cone. - Weight and accuracy of pass. - Next movement after playing pass. - Quality of touch after receiving to set up move. Start this activity as indicated below with passive defenders and no point system. - Defender (player A) plays pass to player B. - Attackers (player B and C) attempt to score in the PUG 2v1 for 3 pts. - The defender cannot leave his line until player B&apos;s first touch and must win the ball above the red line (as shown). - If defender wins possession, he attempts to dribble over the opposite endline he started from. - Once a team scores or ball leaves the area, next group starts. - Quality of first touch and size and angle of touches as they approach defender (keep 2 options, smaller as defender approaches). - Reading defender&apos;s body position to decide to dribble or pass. - Quality of decoying techinque (scissors). - Quality of touch to set up shot or to score first time. - Defender leaves on his pass. - Remove red line forcing defender to come out. - Time limit to score. Consider playing 2v2+1 (on right) for more 2v1 scenarios. 3v3 Small-sided tournament games: 4 teams of 3 players eachteam. 2 fields of 20x30 yards with 2 Pugg Goals on opposite endlines. Play small sided to larger goals if possible since the kids got striking repitiions during the session. 4 Teams of 3, play 3v3 tournament style format where each team will play one another. 3 points for a win, 1 point for a tie and 0 for a loss. Each game should be approximately 6-8 minutes in duration (obviously play a 3 game tournament).